This antibody, also known as the estrogen regulated 24 kD protein and HSP 28, is one of the several heat shock proteins (HSP) produced by all organisms studied. The antigen is induced by elevated temperature as well as estrogen in hormone response. This protein has been studied in human estrogen response tissues such as cervix, endometrium and breast tissue. It may be useful in classification of various hormone sensitive tumors. Full length protein corresponding to Human Hsp27. Partially purified HSP27 derived from MCF-7 cytosol. Our Abpromise guarantee covers the use of ab8600 in the following tested applications. 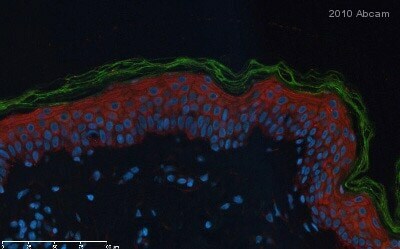 Immunohistochemistry (Formalin/PFA-fixed paraffin-embedded sections) - Anti-Hsp27 antibody [B317] (ab8600)This image is courtesy of an anonymous Abreview. was used as secondary at 1/100 dilution, for 1 hour at 21°C. ab8600 show red staining of Hsp27 in image. Counterstain with DAPI was performed by adding DAPI in a final concentration of 0.5 µg/ml to the mounting medium. Blocking Step: 5% Milk for 12 hours at 4°C. Publishing research using ab8600? Please let us know so that we can cite the reference in this datasheet. Thank you for you reply. I told the researcher about your reply and received an inquiry. Please let me know the lysis buffer you recommend. Thank you for your enquiry. Hsp27 is cytoplasmic in interphase cells, colocalizes with mitotic spindles in mitotic cells and translocates to the nucleus during heat shock. I would recommend that your customer uses a RIPA buffer extraction. I hope this information helps, please do not hesitate to contact us if you need any more advice or information. BATCH NUMBER 151190 ORDER NUMBER -- NOT SPECIFIED -- DESCRIPTION OF THE PROBLEM No expected band and non-specific bands at the size of about 70kDa SAMPLE WCL and nuclear extracts isolated from human HT1080 cells These cells were induced by HSP70. 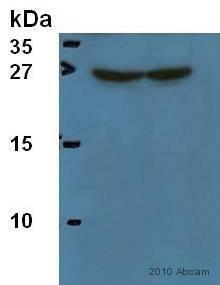 PRIMARY ANTIBODY 1:100 in PBST, for 1 hour at room temp. DETECTION METHOD HRP-based method POSITIVE AND NEGATIVE CONTROLS USED Not test ANTIBODY STORAGE CONDITIONS Cosmo Bio received it on 10/Jan./2006 and stored it at 4 C. The researcher received it on 16/Feb./2006 and has stored it at 4 C. SAMPLE PREPARATION soluble fraction in Kinase Buffer insoluble fraction in SDS Sample Buffer AMOUNT OF PROTEIN LOADED 25ug/lane ELECTROPHORESIS/GEL CONDITIONS 15% acrylamide gel, SDS-PAGE, reducing TRANSFER AND BLOCKING CONDITIONS PVDF membrane Blocking; overnight at 4 degrees in 5% BSA SECONDARY ANTIBODY 1:3000 in PBST, for 1 hour anti mouse IgG Fab-HRP purchased from Amersham This secondary antibody is working well using other primary antibodies. HAVE YOU RUN A "NO PRIMARY" CONTROL? No ADDITIONAL NOTES He used HSP70 antibody (Transduction), HH3 antibody (Abcam) and Rad21 antibody (Abcam) and got good results in this system. Thank you for your enquiry. I am sorry to hear that your customer has been having difficulties with this antibody. I have read your customer's questionaire and they are following a protocol that I would largely recommend. However, I would appreciate it if you could tell me how they are inducing hsp27 as I am unfamiliar with an induction by hsp70. Can you please ask your customer to clarify how this is performed and whether they can be certain of the expression of hsp27 in HT1080 cells. From the literature it is clear that the expression of this target is variable across cell types and cell lines. I would therefore be interested in further information. We recommend that a breast carcinoma cell line is used as a positive control. I look forward to hearing from your customer. We do not know for sure whether this anitbody recognises phosphorylated and non-phosphorylated forms of HSP27. It might be possible to find the answer in published work involving this antibody - there are five listed reference on the datasheet. We do not stock an antibody to HSP27 for which we can confidently claim that it will only recognize the phosphorylated form of HSP27.